The First World War was an unprecedented catastrophe that killed millions and set the continent of Europe on the path to further calamity two decades later. But it didn’t come out of nowhere. With the centennial of the outbreak of hostilities coming up in 2014, Erik Sass will be looking back at the lead-up to the war, when seemingly minor moments of friction accumulated until the situation was ready to explode. He'll be covering those events 100 years after they occurred. This is the 71st installment in the series. 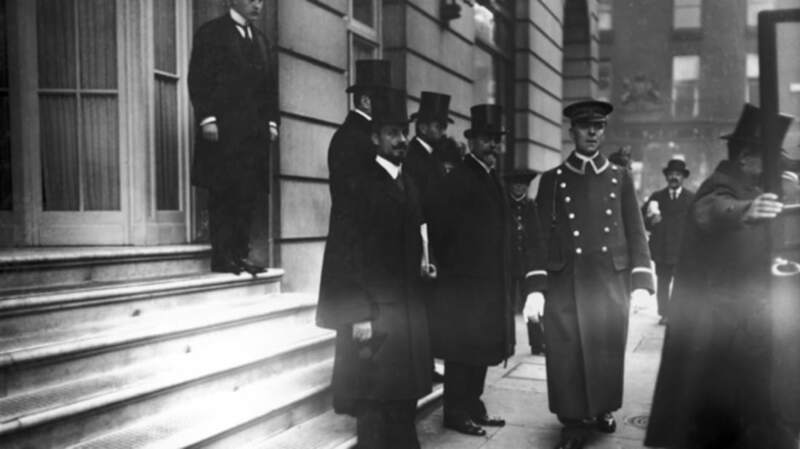 After six months of negotiations at the Conference of London (above), on May 30, 1913 the members of the Balkan League—Bulgaria, Serbia, Greece, and Montenegro—signed a peace treaty with the Ottoman Empire ending the First Balkan War. In the Treaty of London, brokered by Europe’s Great Powers, the Turks agreed to give up virtually all of their European territories to the victors, redrawing the map of the Balkans and bolstering the populations (and self-confidence) of the Balkan states. The loss of the Balkan provinces deprived the Ottoman Empire of 54,000 square miles with a population of 4.2 million, although 400,000 Muslim refugees from the lost provinces ended up fleeing to other parts of the empire. From 1910 to 1913, between the First Balkan War and the Italo-Turkish war Ottoman territory shrank from roughly 1.39 million square miles to 928,000 square miles, while the empire’s population fell from around 26 million to 20 million (there are few firm statistics). 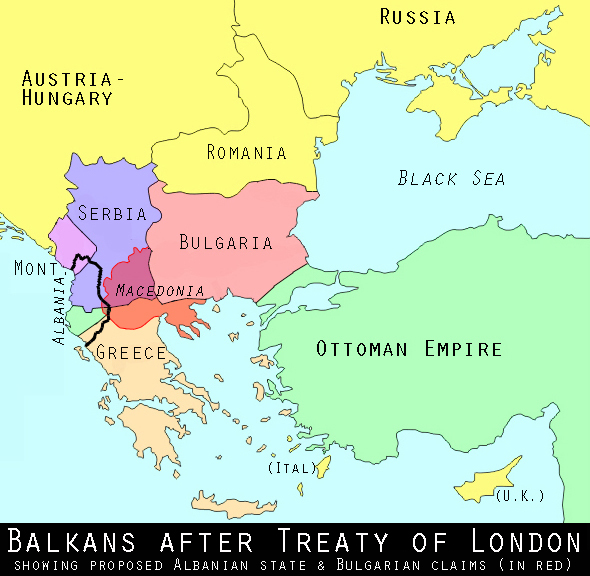 Although it confirmed the Balkan League’s gains at the expense of the Ottoman Empire, the Treaty of London left several major issues unresolved. First of all, the Great Powers deferred a decision on the exact borders of the new, independent state of Albania to some later date, raising hopes in Serbia and Greece that they might be allowed to keep some or all of their Albanian conquests after all (in fact, on May 14 they divided up Albania into Serbian and Greek spheres of influence). This put Serbia on a collision course with Austria-Hungary, whose foreign minister, Count Berchtold, helped create Albania in order to prevent Serbia from gaining access to the sea. Furthermore, the Treaty of London said nothing about the division of spoils from the First Balkan War, leaving the Balkan League to divide their conquests among themselves. Since Bulgaria still claimed a large amount of territory in Macedonia occupied by the Serbians and Greeks (a final Serbian request to revise the treaty dividing up Macedonia was rebuffed on May 26, 1913) and also refused to cede its own northern territory of Silistra to Romania, this was an invitation to renewed conflict between the former allies in the Second Balkan War, now just a month away. Following the Ottoman Empire’s humiliating defeat in the First Balkan War, it was reasonable for the leaders of Europe’s Great Powers to assume that the “sick man of Europe,” in decline for centuries, was entering its final death throes. This, in turn, triggered a scramble by European diplomats, soldiers, and businessmen, all jockeying for a piece of the moribund empire when the big crack-up finally came. The main menace came from Russia, which coveted Constantinople and the Turkish straits and was making inroads in eastern Anatolia as well: In June 1913, the Austro-Hungarian ambassador to Constantinople, Marquis Johann von Pallavicini, reported a Russian diplomat’s boast that the division of Anatolia was a done deal, and a similar warning came from the German ambassador, Baron Hans von Wangenheim, that same month. 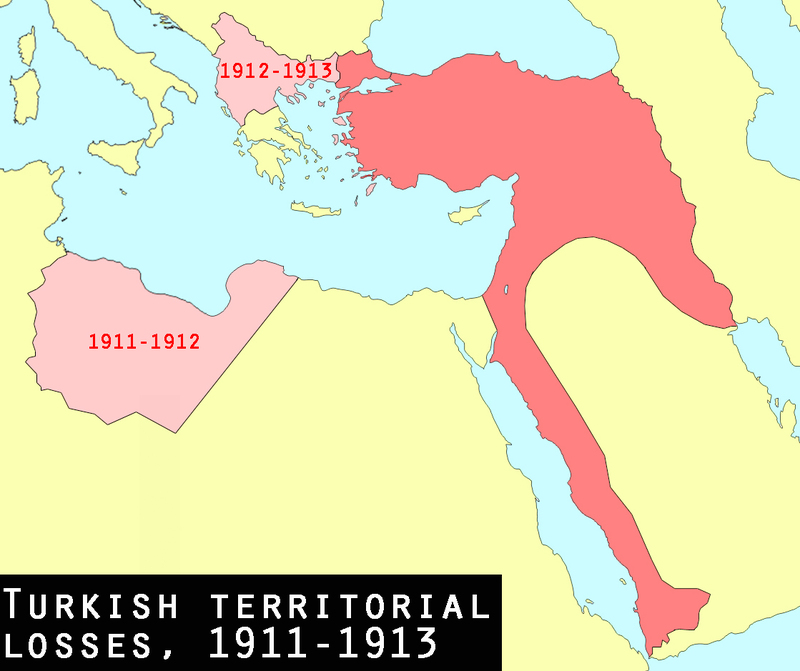 Meanwhile, France and Britain were eyeing Ottoman territories in Syria, Palestine, Mesopotamia, and the Arabian Peninsula, which they later divvied up during the Great War with the Sykes-Picot Agreement, signed March 1916. Italy had just taken Libya as well as Rhodes and some other islands in the Aegean—and could conceivably take more territory on the coast of Asia Minor. Among the Great Powers, Russia, France, Britain, and Italy were all well-placed, either by virtue of their geographic position or naval power, to project influence across the Middle East. Germany and Austria-Hungary, however, were much less likely to benefit from a division of the Ottoman Empire in the short term; indeed, Germany’s main attempt to build its influence in the region, the Berlin-to-Baghdad Railroad, relied on continued peaceful relations with the Turks. So it was to their advantage to prop up the Ottoman Empire as long as possible, or at least until they were in a position to back up their claims with force (Kaiser Wilhelm II was hardly averse to the idea of taking a chunk of Turkish territory when the time came: On April 30, 1913, he privately vowed that when the Ottoman Empire disintegrated, “I will take Mesopotamia, Alexandretta, and Mersin,” referring to two Mediterranean ports in what is now southeast Turkey). Perhaps the most important consequence of the First Balkan War, however, was the rise of Serbian power and prestige, which triggered serious alarm in Austria-Hungary. As a result of the Balkan wars from 1912 to 1913, Serbia’s area almost doubled from 18,650 to 33,891 square miles, and its population jumped from 2.9 million to 4.5 million. Meanwhile “Yugoslav” activists (who advocated the union of all the Balkan Slavic peoples) were whipping up Slavic nationalism among the Dual Monarchy’s Serbian, Bosnian, and Croatian populations. Slavic nationalists in the Kingdom of Serbia were fanning the flames, and the Russians—while urging moderation and compromise in public—were secretly egging them on: On December 27, 1912, the Russian foreign minister, Sergei Sazonov, promised the Serbian ambassador, Dimitrije Popović, that “the future belongs to us,” adding that the Slavs would “shake Austria to the foundations.” On February 13, 1913, Sazonov described Austria-Hungary as a “boil” that would eventually be “lanced” by the Serbs with Russian support. Austria-Hungary’s leaders were keenly aware of Serbian and Russian ambitions. The belligerent attitude of the chief of staff, Conrad von Hötzendorf, was well-known, and his views were gaining ground with Count Berchtold (in spite of the opposition of Archduke Franz Ferdinand, the heir to the throne). By mid-1913, after months working to keep the peace, in the face of repeated Serbian provocations Berchtold was swinging around to the war party. On July 3, 1913, he warned the German ambassador, Heinrich von Tschirschky, that Austria-Hungary was in danger of losing its Slavic territories to Serbia. As for Austria-Hungary’s ally, the Germans left no doubt they believed a confrontation was coming eventually, mirroring Russia’s advice to Serbia. On April 28, 1913, the former German chancellor Bernard von Bülow wrote to the influential Austrian publicist Heinrich Friedjung, lamenting that Austria-Hungary ought to have occupied the Serbian capital, Belgrade, at the beginning of the First Balkan War—and clearly implying that Vienna should seize the next chance to cut Serbia down to size, whenever it might arise. Bülow also dismissed the risk of Russian intervention: “Right from the beginning of the Balkan war I said the odds against a major war were nine to one. Today I say they are ninety-nine to one, but only if the Central Powers pursue a manly and courageous policy.” In a little over a year, the same attitude would lead the world to disaster.